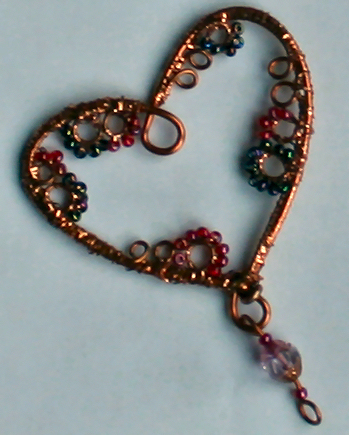 I love copper and now I have a very pretty heart to use in a future crazy quilt project. My daughter was cleaning out her closet and returned a hand knit sweater that I originally made for myself. Well, it made me look like I weighed a ton, so she happily took possession. She looked fabulous in it. Styles have changed, and she no longer wears it, so it has come back home to live with me for a bit. 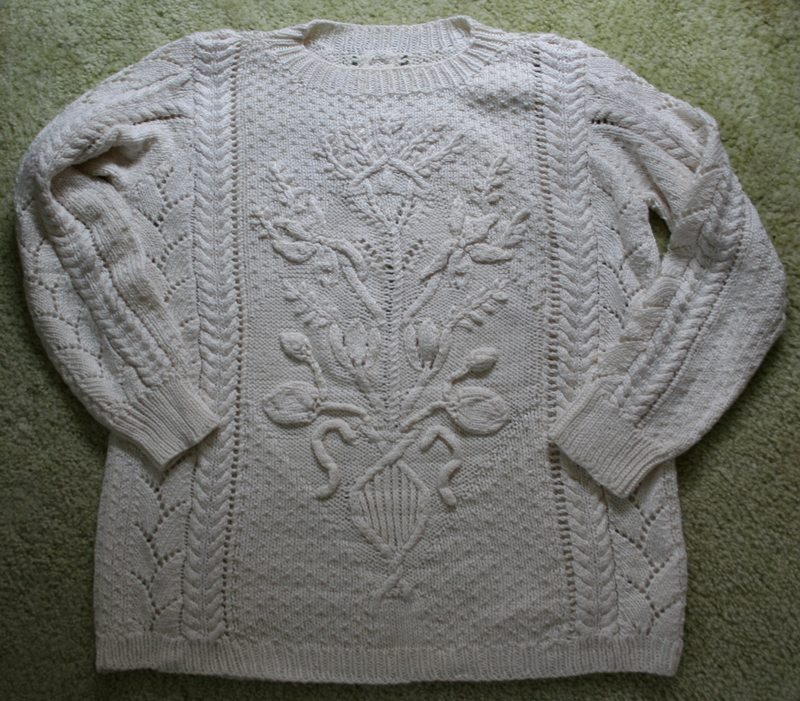 If anybody is interested in a silk, handknit sweater, please leave a comment on this post and we can talk terms. Now for a regional weather report. My home is close to Black Creek in Churchville, NY and a quarter of my garden is under water as I type this post. I dearly and purely hope it will STOP RAINING sometime this Spring. We’ve had enough, thank-you very much, Mother Nature. Please send some to drought ridden Texas. The animals and humans would appreciate a little relief. Thursday was our monthly RAFA meeting, and I managed to get there on time for a change. It was great to have a chance to chat with my friends before the business meeting started. Then onto Show and Tell. Was it ever filled with lots of eye candy. Aren’t the colors wonderful? Everything Caris tries turns out beautifully. It is so ethereal. I tried it on, but my body type was not made for shawls, otherwise it would have come home with me. I really lusted after that shawl. It was gossamer light, and a truly beautiful piece. 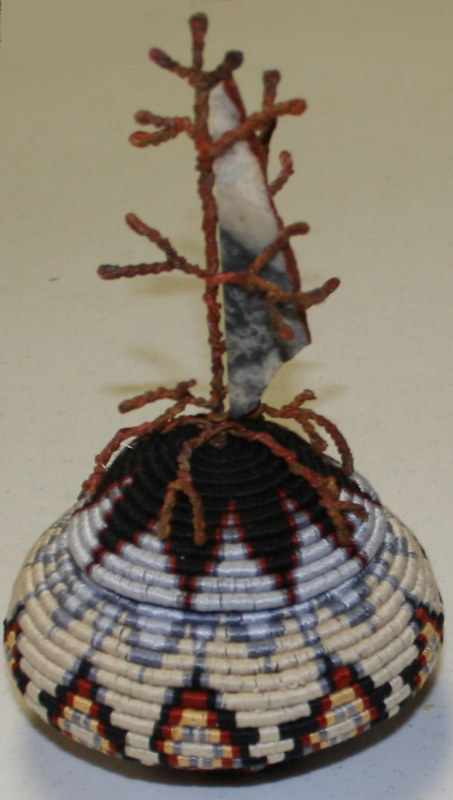 She electroformed a branch, and attached the stone that inspired the colors for this piece to the branch. This basket fits in the palm of my hand. It is currently on display in a local library, and we were lucky to see it before the general public. Is that not gorgeous? It’s on a base of very fine silk and I could not get over how such a lightweight fabric could support those beads. 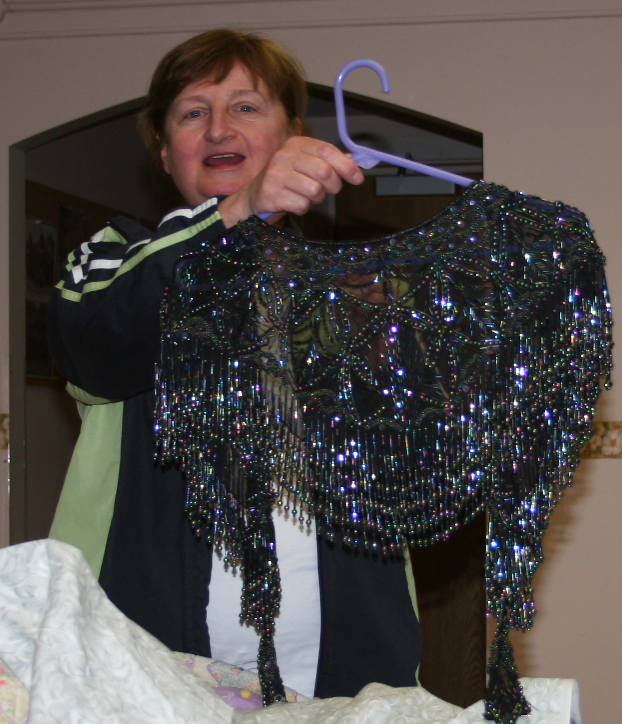 That shawl was really heavy – about 5-10 pounds. What a great idea. I’m sure her class will have a waiting list. 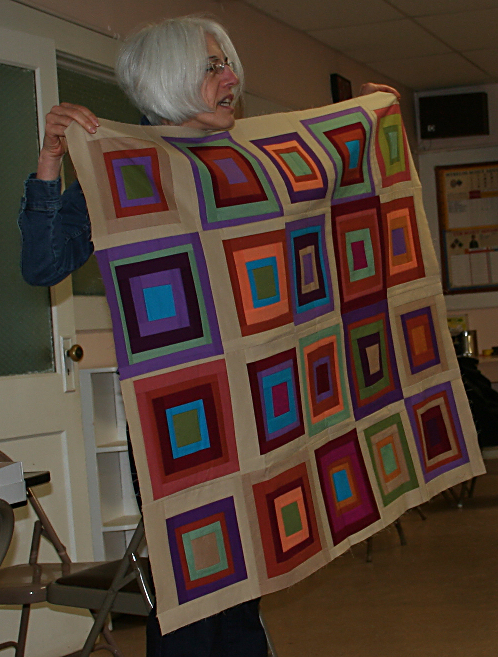 I love her choice of colors, and wish my pictures from last month’s meeting had been better so you could see some of the quilts she showed last month. She does everything from snippet quilts, to applique, to piecing. She is definitely multi talented. In the afternoon we enjoyed a presentation by Eugenia Barnes. 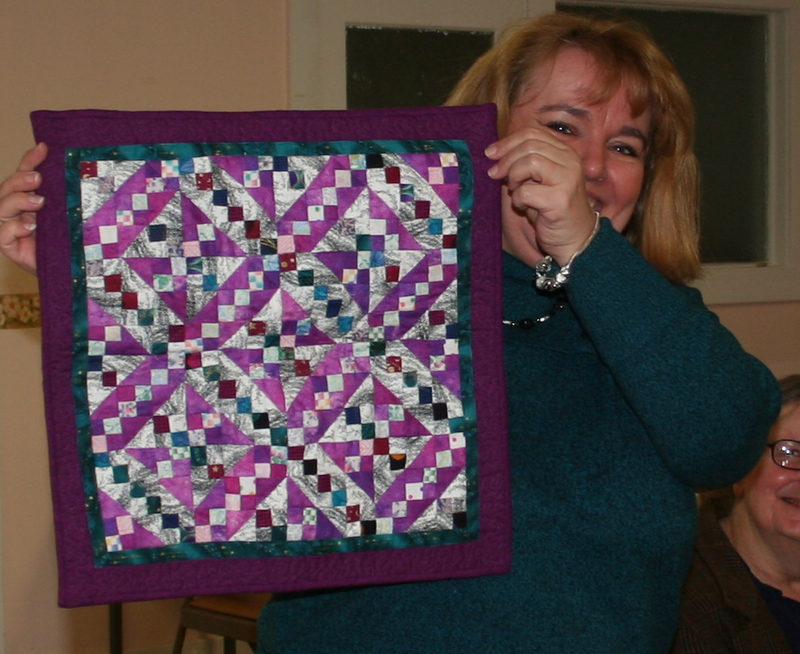 She is a well known quilt judge and quilt appraiser. who is an excellent speaker. Eugenia has 2 masters degrees, so she is eminently qualified to speak on the quilt experience, but she is also a highly entertaining speaker. We learned a lot while we were having fun. This is a win-win in my book. One tidbit I’d like to share with everyone is that she does not recommend we dye with tea. The acid in the tea is not a friend to our fabric. I’ve read this before, and heard that from people who work with quilt restorations also. She suggested we use vanilla – the real deal vanilla – not the artificial stuff. I’ve never heard of this before and can’t wait to try that suggestion out next week. That is my quilt for GVQC’s Diamond Jubilee Challenge. We had to use the blue/white/silver specked fabric on the left, or there wouldn’t have been a speck of blue in the entire quilt. It’s a cool based color, and my preferences are for warm based colors. I was pleased with the overall composition, but realized I should have put a very small amount of the magenta in the quilt as a zinger fabric, or toned it down by putting a light grey or blue tulle over it. One of these days, I’m going to get the composition AND the color just the way I want it. Three pieces of fabric were made in my paint software. I do so love Paint Shop Pro. The diamond was multiplied and arranged to form a larger diamond – diamond/Jubilee – a natural shape for this celebration. 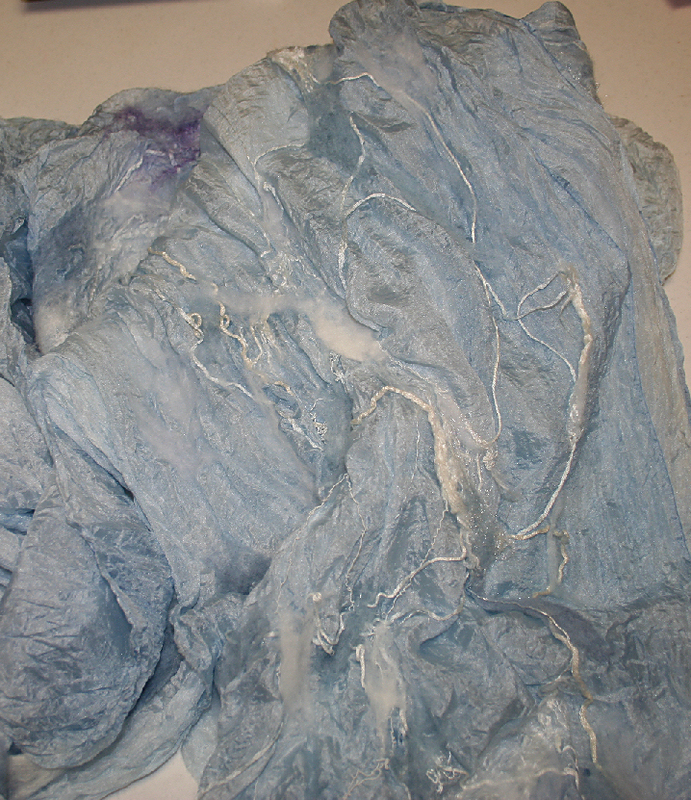 The blue color from the challenge fabric was used in different values to create that spiral effect. This 60 degree diamond was in the book Simply Amazing Spiral Quilts by RaNae Merrill, and it says “the patterns and drawings in this book are for the personal use of the reader.” It comes with a CD and is full of all sorts of wonderful designs. I highly recommend adding this book to your personal library. 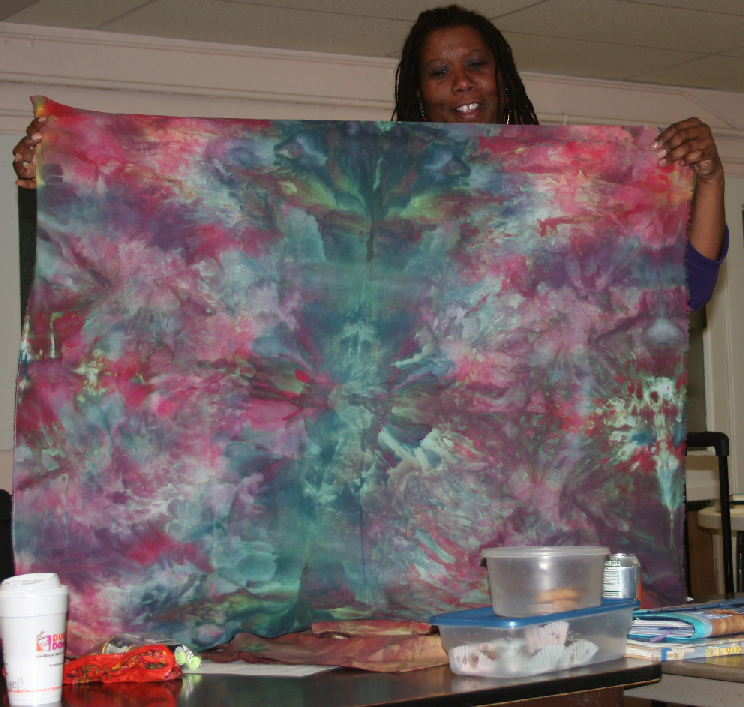 The banner with GVQC’s name and year was printed on fabric that had 3 layers of color on it with a wood grain texture. Then the text was added – in my very favorite font – Wedding Invitation, and I enhanced the text edges so it would pop. I’ve been a member of GVQC for a very long time, and thought it would be nice to include some of the pins I’ve collected over the years. 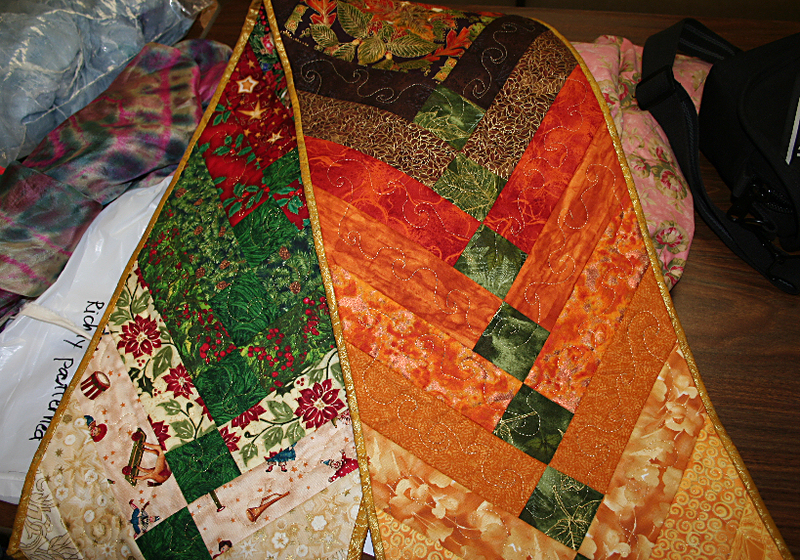 They all represent the many hours I’ve spent volunteering for our quilt shows. The first pin is from the 90’s when I was also President of the club. I only used the pins that had blue in them. 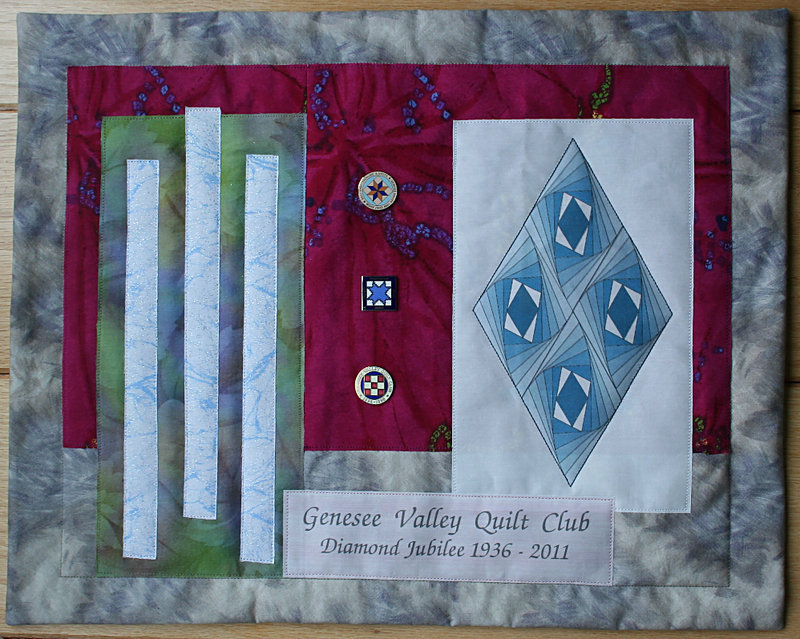 My inspiration for this quilt came from all the people who have been members of GVQC over the years. They created a community of like minded individuals to share their knowledge, their lives, and their desire to promote the art, and tradition of quilting. I hope I have done them proud.